A long time ago, back in 2012, an Indie Project was started by a person named Hoppip. Its primary goal was the creation of a Go-Kart Racing Game that takes place in the My Little Pony Universe of the globally-acclaimed TV Show "My Little Pony: Friendship is Magic." The Project's name is "Pony Kart." The effort that was put into this project by Hoppip's Team is nothing short of admirable as the whole game was created from scratch. But great misfortune struck as a plethora of bugs surfaced during its creation and Hoppip's Team had to give up on the project as the serious responsibilities of real life, such as college and work, meant that they no longer had any free time to invest towards developing "Pony Kart". Because of these unfortunate turn of events, the project was declared dead until a new team took up the task in November 2013. They picked up where Hoppip's Team left off and made some considerable progress in improving and refining the Game into a playable Beta. But sadly, this effort to breathe new life into "Pony Kart" appears to have been short lived as the new team went silent on August 2014. Once again, real life had called to them with more important matters such as school and work. And "Pony Kart" was effectively dead, or put on "Indefinite Hiatus", for a second time. I looked at the troubled history behind this dream and I can't help but ask myself "Why did Pony Kart fail two times already?" Why did it fail to get the Interest and Support it desperately needs to become reality? And I've come to my own conclusion that "Pony Kart might have been too Ambitious for its own good". I honestly don't know how much work is still required to make "Pony Kart" into a complete product but I can safely say that the workload is simply too much for anyone to handle without all of the help they can get from anybody that is willing to take part in the project. And knowing this makes you realize that developing a game from scratch really is a very difficult task for those that have some knowledge in writing C++ Code. But even though "Pony Kart" has failed two times already, it is not a dream that is doomed to never see the light of day. More than ever now, I still believe in the possibility of being able to play a Go-Kart Racing Game with MLP Characters because it is NOT an impossibility. Herooftime1000 made Super Fluttershy Land 2, an MLP fan mod of Super Mario Land 2. Herooftime1000 made Pony Poki Panic, an MLP fan mod of Super Mario Bros 2. QuickFix made Pony Fantasy, an MLP fan mod of Final Fantasy 6. RydelFox made Equestriabound, an MLP fan mod of Earthbound. And botchos made Super Pony: All-Stars, an MLP fan mod of Super Mario: All-Stars. So why not have an MLP fan mod of Super Mario Kart? Creating a Graphics Hack isn't a question of possibility. It's a question of Generosity: Who is willing to listen and provide their time and artistic expertise in spriting to help realize the project. Because Generosity and artistic expertise is all that is needed to create Super Pony Kart from Super Mario Kart. 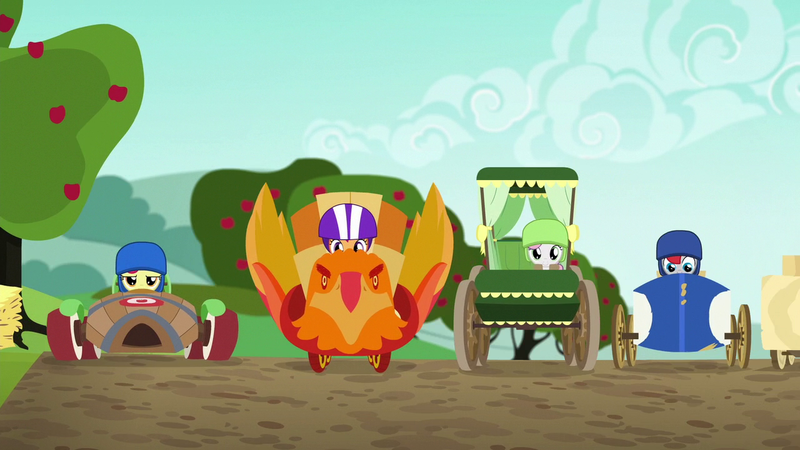 And with the coincidental showing of the Season 6 Episode "The Cart before the Ponies", there is certain to be a spark of renewed interest for this idea. "With all of your honesty, loyalty, kindness, and generosity, won't you please help Super Pony Kart become a reality?" All I need are some Graphics Designers/Sprite Artists that are able and willing to make some generous contributions to this project. If you have the time and necessary skills to do Sprite work, please talk to me. I'm more than ready to discuss concepts, ideas, and what needs to be done. If you know someone else that does, please direct them to this thread. I can't make these mods without your help because I don't have the Artistic Talent to make even decent-quality pony sprites. I can probably help. I haven't worked with SMK specifically but I do have some experience in pixel art and graphics hacking. (12-01-2016, 06:33 PM)Zharkaer Wrote: I can probably help. I haven't worked with SMK specifically but I do have some experience in pixel art and graphics hacking. What would you like to do for this project? An Easy Task or a Hard Task? (12-01-2016, 06:46 PM)Arima Wrote: Thank you, Zharkaer. What do either of those entail? The Hardest Tasks for this project is to replace the Driver Sprites because there's a lot of tile data that needs to be modified which will take a considerable amount of time. The Easier Tasks are replacing the smaller and more minor details such as Lakitu, the Trophies, and the Items. (12-01-2016, 07:01 PM)Arima Wrote: The Hardest Tasks for this project is to replace the Driver Sprites because there's a lot of tile data that needs to be modified which will take a considerable amount of time. I can send you the Sprites through E-Mail. Contact me with a PM.